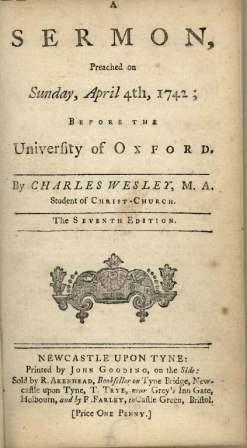 Charles Wesley was born into a home full of faith and learning. 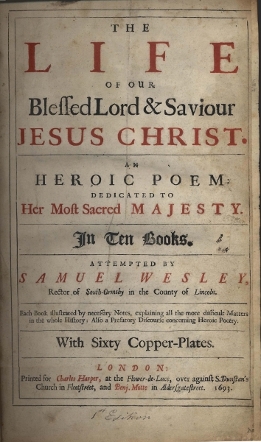 Father Samuel, a rector in the Church of England, was a published poet. 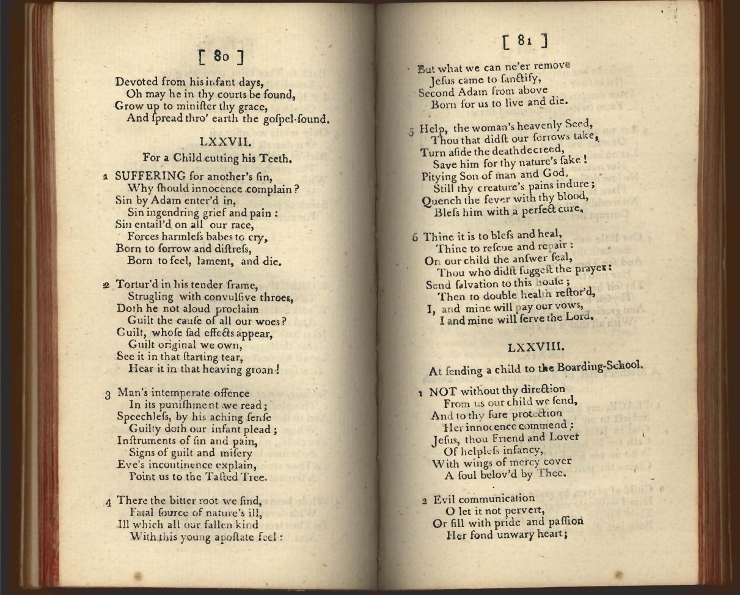 Eldest brother Samuel, a distinguished classicist, headmaster, and also a priest in the Church of England, wrote verse on subjects sacred and secular. Mother Susanna was a model of discipline and piety. Sister "Hetty" published her thoughtful poems in the popular magazines of the day. 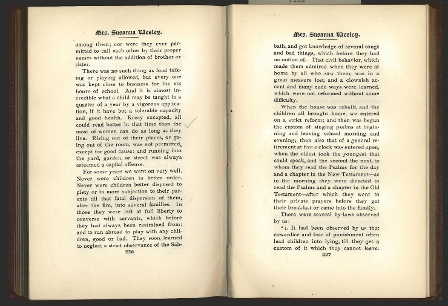 This volume was dedicated to Queen Mary to curry favour. 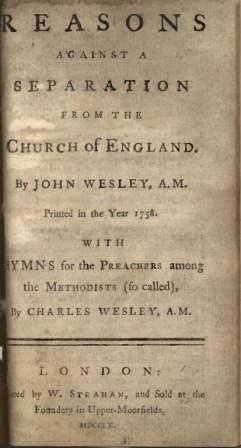 Wesley believed that the dedication enabled his preferment to the crown appointment at the Epworth parish. 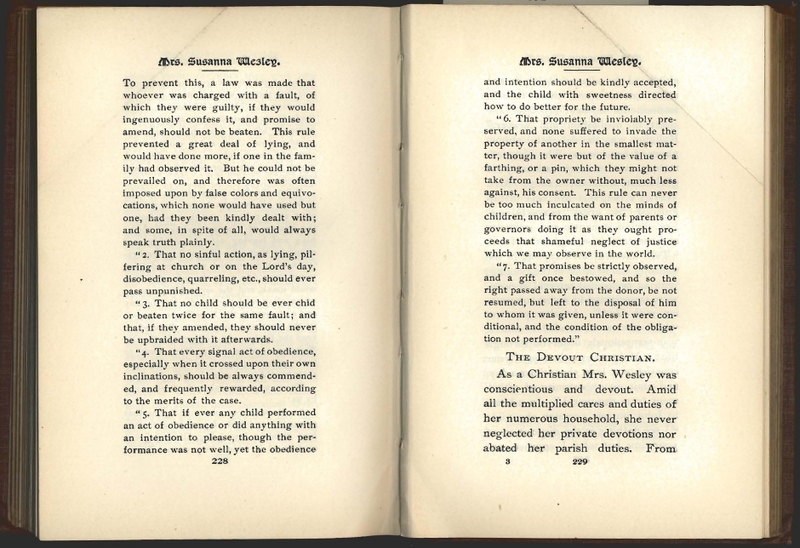 Susanna Annesley Wesley explained her rules for childrearing in a letter to John. The three boys and seven girls in the Wesley household received the same education. Each was taught to read on his or her fifth birthday and was required to memorize passages of both scripture and poetry at an early age. Brother Samuel was Charles' teacher at Westminster and most frequent correspondent until his death in 1739 at age forty-seven. 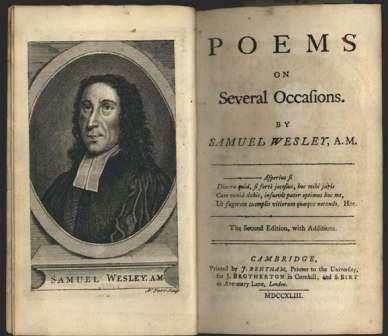 This popular volume of poems had a posthumously published second edition which included Samuel's portrait and a eulogy to him. 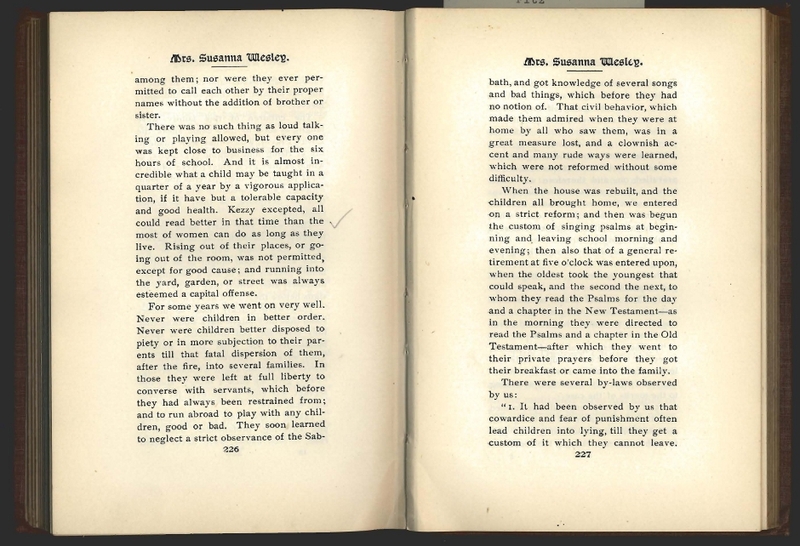 "Address to Her Dying Child"
Like her brother Charles, Hetty composed poetry based on personal experience. 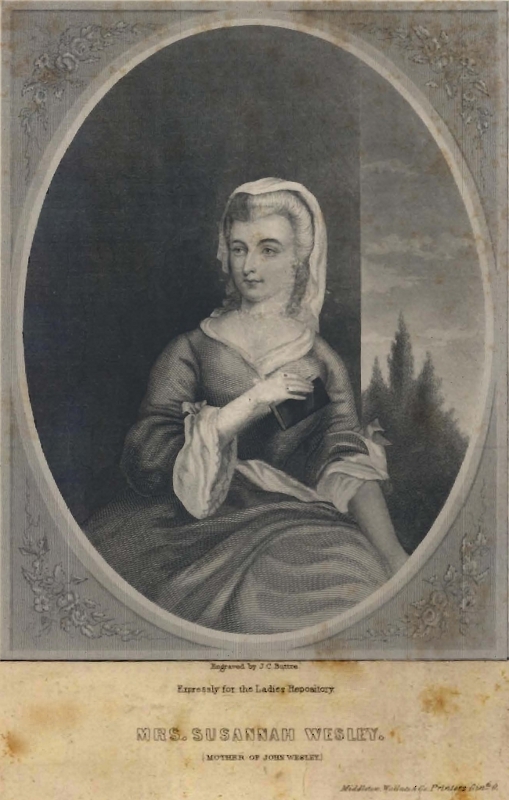 She gave birth to six children who all died during infancy. The following poem expresses her grief. Smiling wonder of a day! Anguish deeper than thine own. From schooling at Susanna's knee, to the organized and devout Holy Club at Oxford which earned them the name "Methodists," continuing with a failed mission to the Georgia in 1736, and culminating in heartfelt conversion experiences within three days of each other in May of 1738, Charles and John shared a spiritual journey. They both became itinerant preachers, traveling as far as Ireland to establish societies after the principles of the Methodist movement. Though often separated by distance, temperament, and sometimes strongly held opinion, John remained Charles' "first and inalienable friend." 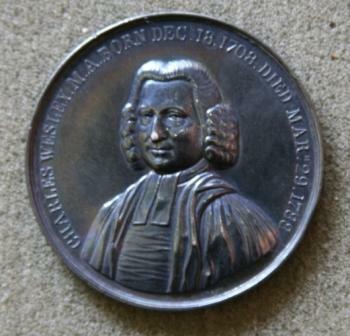 John made Charles his legal successor as leader of the Methodists in 1746. 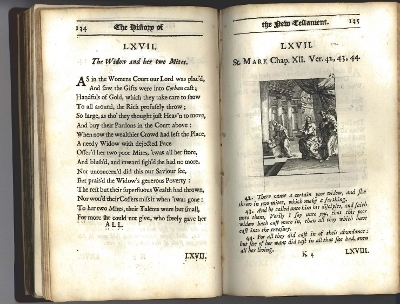 In their hymn publishing collaboration, Charles most often wrote original poems and John edited. John was careful to excise anything too sentimental or personal as well as anything which did not pass his theological scrutiny. In some sense the more emotional Charles and his more cerebral brother were the "yin and yang" of Methodism. 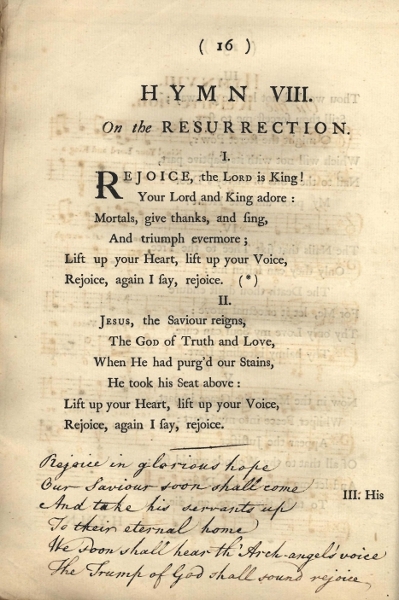 In all of Charles and John's early hymn collaborations, as in this volume, there is no attribution of authorship. Determining which came from Charles' pen was determined from later editions of the work and from comparison to journals. 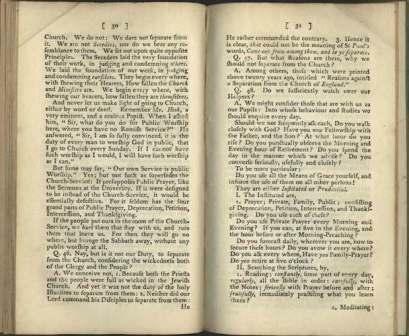 Only two of Charles' original sermons were published during his lifetime, including this one on Ephesians 5:14. 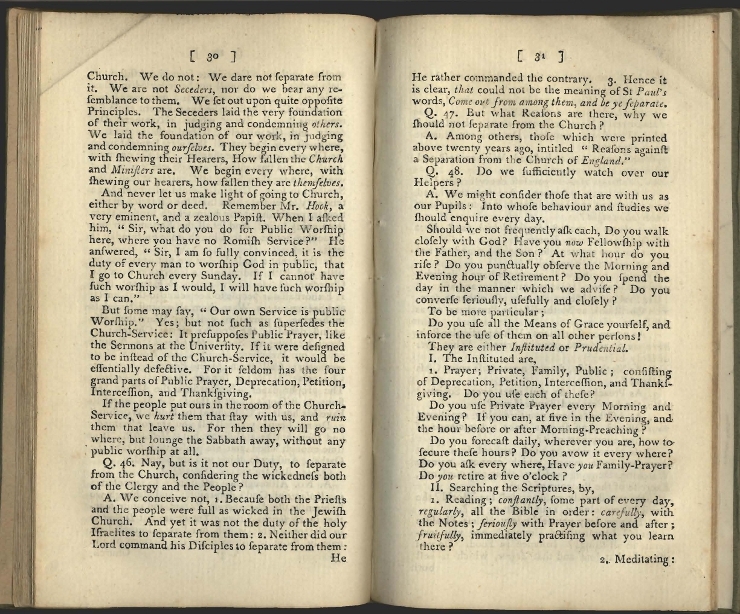 A critical edition of all of Charles's 23 sermons was not published until 2001 after several encoded manuscripts were discovered in the later 20th century. 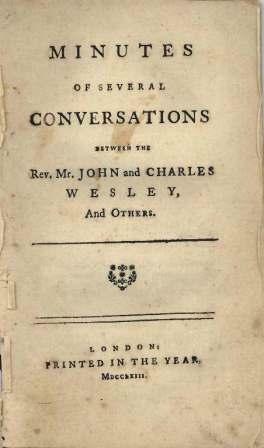 Recorded questions and answers with both John and Charles defined doctrine and practice for the early Methodist Societies and preachers. These "Large Minutes" were precursors of the conference minutes still published throughout the denomination today. 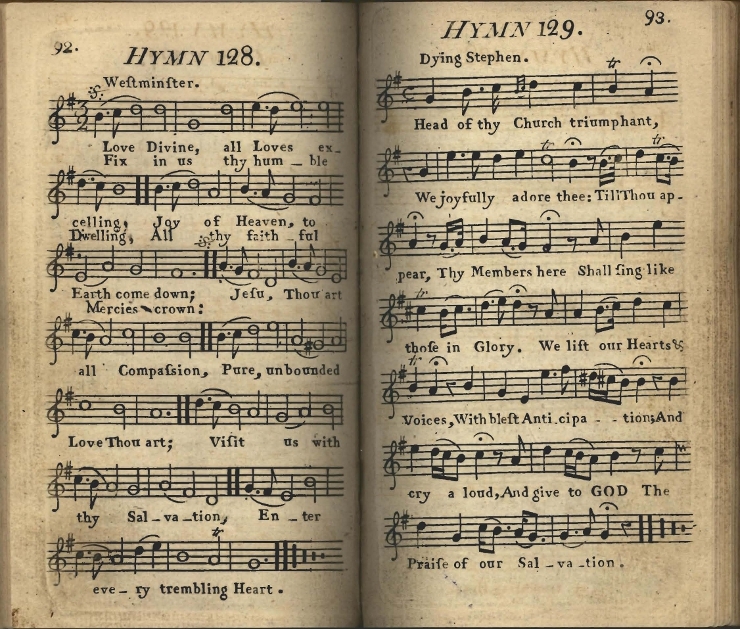 The choice of hymns in the "Large Hymnal" was John's alone. 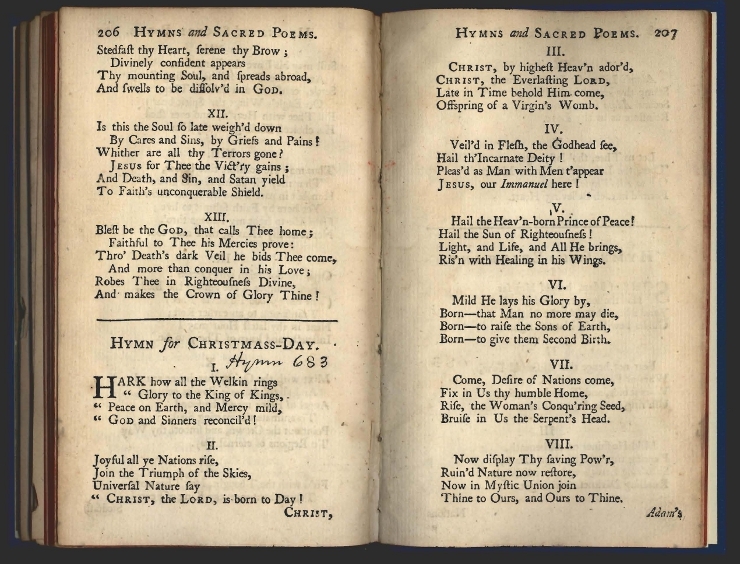 Most were from Charles' pen and were compiled from the smaller pamphlet style hymn books which had been offered for sale inexpensively in the societies. 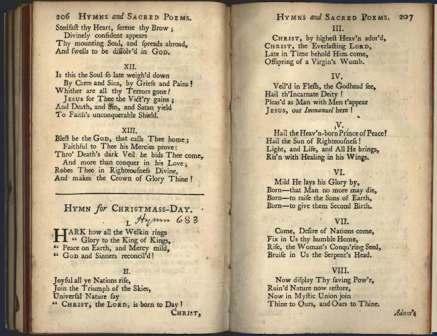 This edition began what became a Methodist tradition of making "O For a Thousand Tongues to Sing" the first hymn. 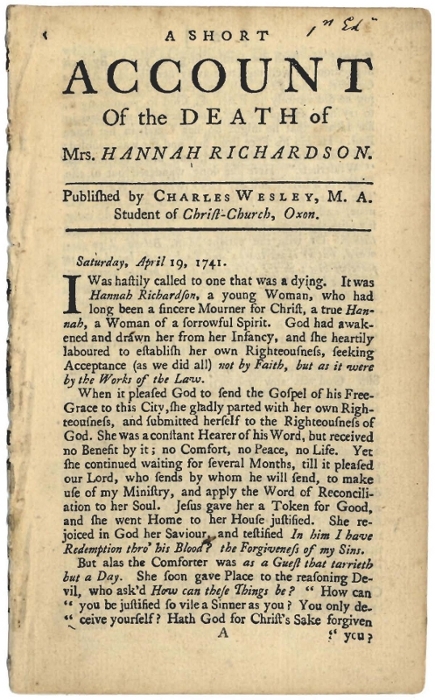 This sole piece of prose written by Charles in his lifetime is as much about the life and faith struggles of one of his converts as it is about her eventual peaceful death. 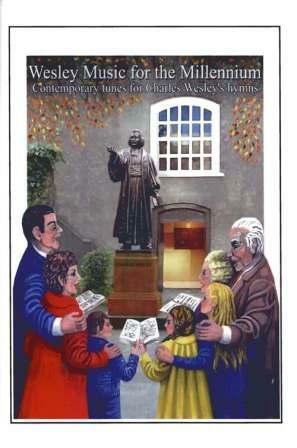 Such accounts gave encouragement and theological instruction to the Methodist Societies. On his travels to Wales in 1747 Charles met and fell in love with Sarah (Sally) Gwynne, the daughter of a local magistrate. She was educated, cultured, wealthier than Charles, and twenty years younger. John, who approved of the match, assured her worried parents that Charles would have a living of £100 per year from their jointly published books. John married the couple on April 8, 1749. 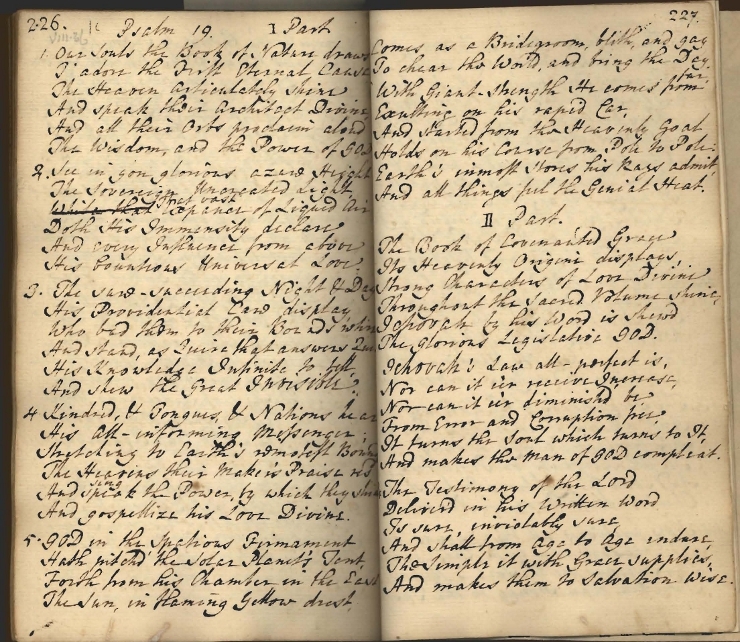 Sally traveled with Charles on his preaching trips until they settled in Bristol in 1756, finally moving to London in 1771. The Wesleys had eight children, three of whom survived to adulthood: Charles, Jr., Sally, and Samuel. 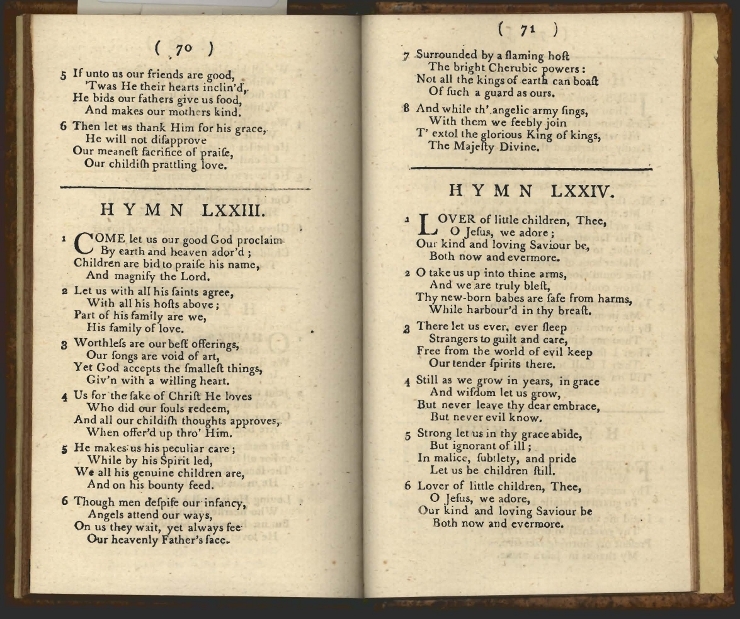 Throughout his predominantly happy family life, Charles wrote hymns designed to aid families in their devotion and piety. The hymns spoke to situations familiar to Charles through his own family and from his pastoral experience. 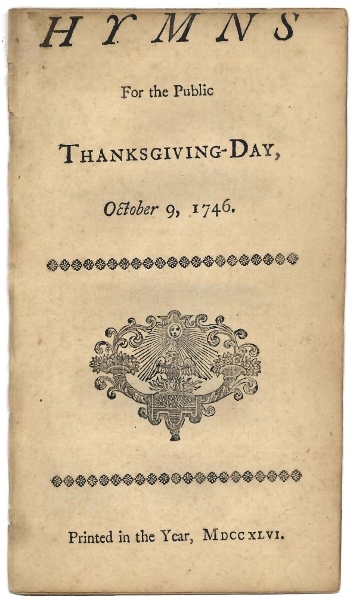 The first edition of this work was published in 1767 when Charles and Sally's children were young. 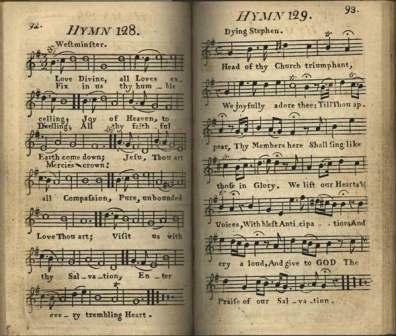 Most of the hymns cover the same, decidedly non-juvenile subject matter and theology as adult hymns, but a few, including those displayed, use simpler vocabulary and gentler ideas. 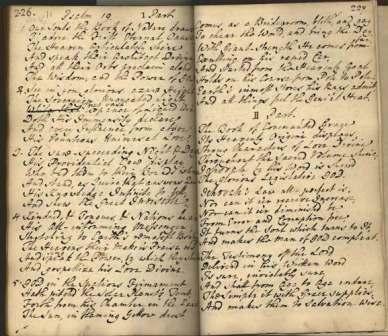 This is a manuscript of Wesley's poetic paraphrase of Psalms with the last twelve pages in his handwriting. Despite John's zeal and organizing abilities, the Methodist Movement would have withered on the vine without the nourishment of Charles' hymns. Through his lyrics, singers learned the scriptures and doctrines of grace, assurance, and the call to Christian perfection. 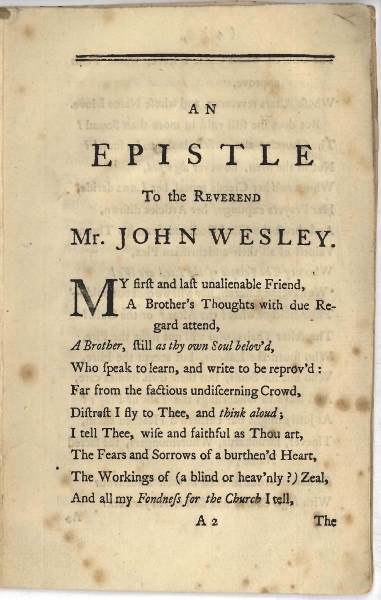 "Love Divine All Loves Excelling," is one of many Wesley hymns on Christian Perfection. 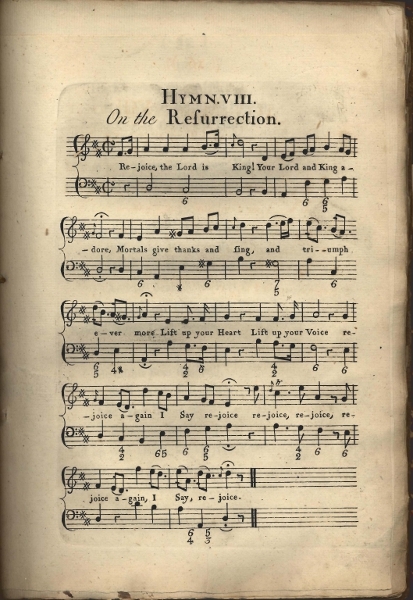 Frequent word changes of this hymn reveal the misunderstandings and controversy regarding this major tenet of Methodism. 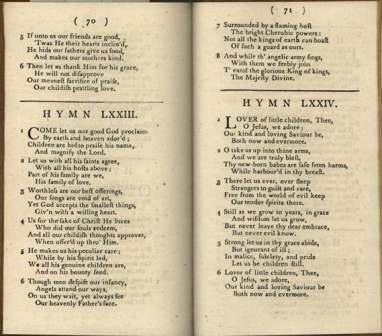 In The Large Hymnal of 1780, John eliminated one verse completely so as not to encourage his people toward a Calvinistic theology. 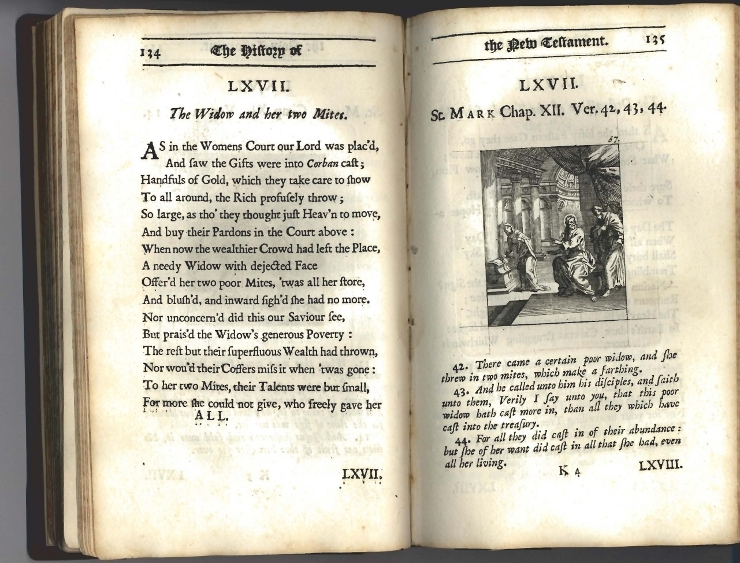 A myth exists that Charles set sacred poems to tavern songs, but that is not true. 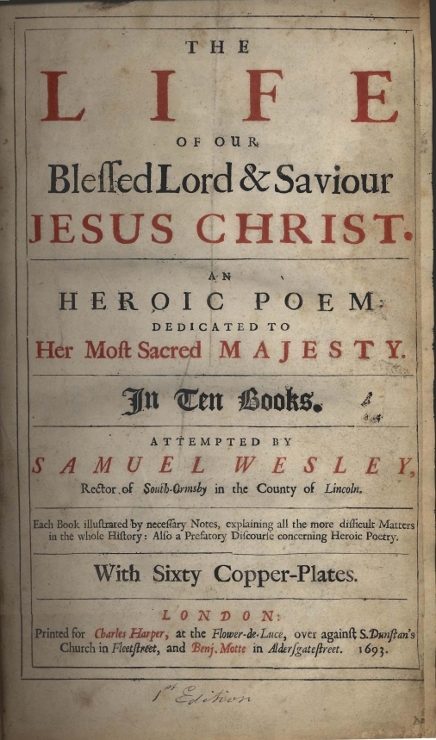 He did write parody, such as "Love Divine all Loves Excelling" which is derived from a song from Purcell's opera King Arthur whose tune Wesley preferred. Charles also thought highly of George Frederick Handel and used his melodies, three of which were written expressly for Charles' verse. 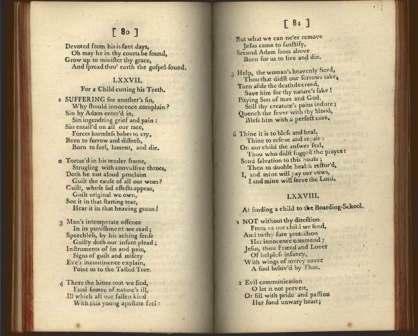 Another favorite composer was John Lampe whose music is the setting for Charles' lyrics in this volume. 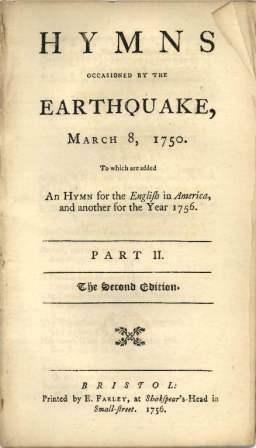 The pastoral and prophetic ministry of Charles was apparent in his verse concerning the fear and suffering surrounding Earthquakes in London and Lisbon in the 1750's. His loyalist politics were also clear in the polemical verses aimed at any threat to the divine right of British monarchs. 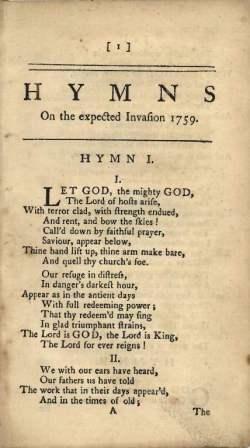 This poem was written in gratitude to God for the victory over the Jacobite uprising in Scotland. The threat to King George II from Charles Stuart and the Highland Clans was to both throne and faith, because "the young Pretender" was Roman Catholic. 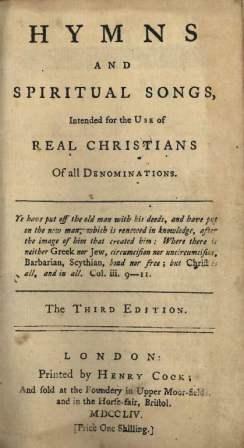 In the hymns Wesley variously calls the Scots: Savage-Band, Heathen, Vulturs (sic), and Sons of Rome and Satan. 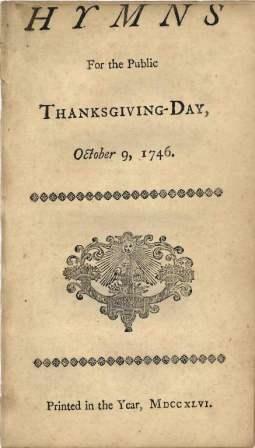 He concludes the volume with a general call to praise and repentance for the nation. 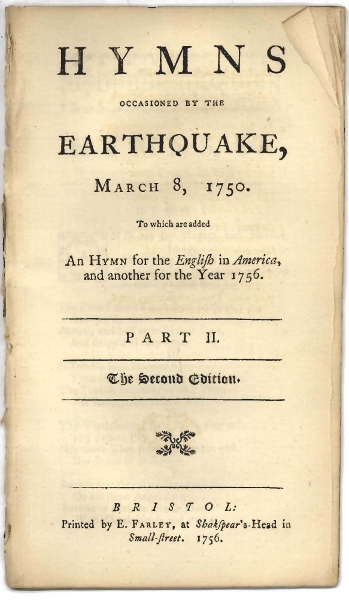 In February and March of 1750 earthquakes shook London. Charles was leading worship at the Foundery during the quake in March, and Psalm 46 came immediately to his mind. He composed a series of hymns praising God who both causes and provides refuge from devastation. In 1755 another quake and accompanying tidal wave took 70,000 lives in Lisbon, Portugal. 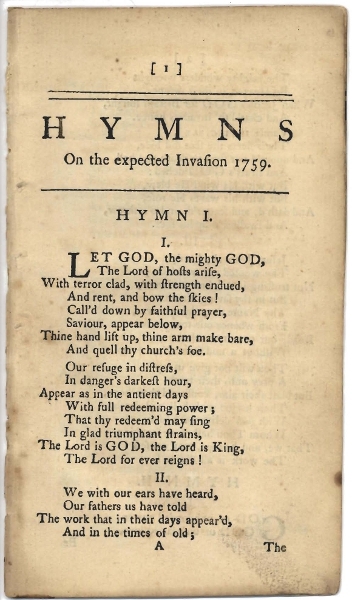 The Earthquake Hymns were republished along with a new poems expressing both gratitude for "saving fear," and hope for the coming of Christ's final reign. Whereas his contemporaries had confidence in British military ability to repel any French aggression, Charles Wesley, through his poems, urged the nation to make supplication to God for deliverance. In the mid-1750's Charles became increasingly concerned over the potential of the Methodist Movement separating from the Church of England. Part of that concern involved the quality and accountability of lay preachers. Some preachers confessed to immoral behavior; some sought more status and sacramental privilege. 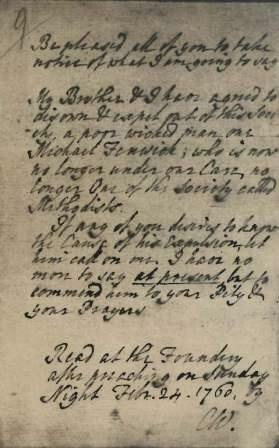 John gave the examination and encouragement of lay preachers over to Charles beginning in 1751. Charles claimed in a letter to a friend that "My brother made a preacher of a tailor; I, with God's help, shall make a tailor of him again." Charles' opinion of Fenwick was that "he preached nonsense." Charles expelled Fenwick on at least two occasions, but John reinstated him. 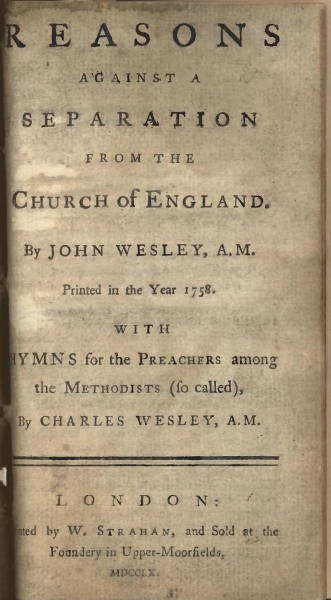 Published in the same year that Charles threatened to withdraw from Methodist Conferencing, this poetic persuasion urged John to keep the movement a reform within the Church of England. Charles called the Church their "Mother's bosom" and asked John, "Wilt Thou with me in the Old Church remain,/ And share her Weal and Woe, her Loss or Gain,/ Spend in her Service thy last drop of Blood,/ And die-to build the Temple of our God?" 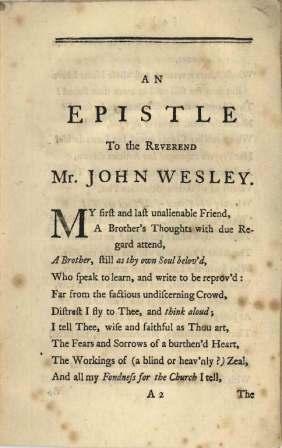 John Wesley wrote an eleven page treatise with the above title and Charles added a series of seven hymns which encouraged humility, dedication to proclaiming the Gospel, and loyalty to the Church of England to be used by the Methodist preachers. 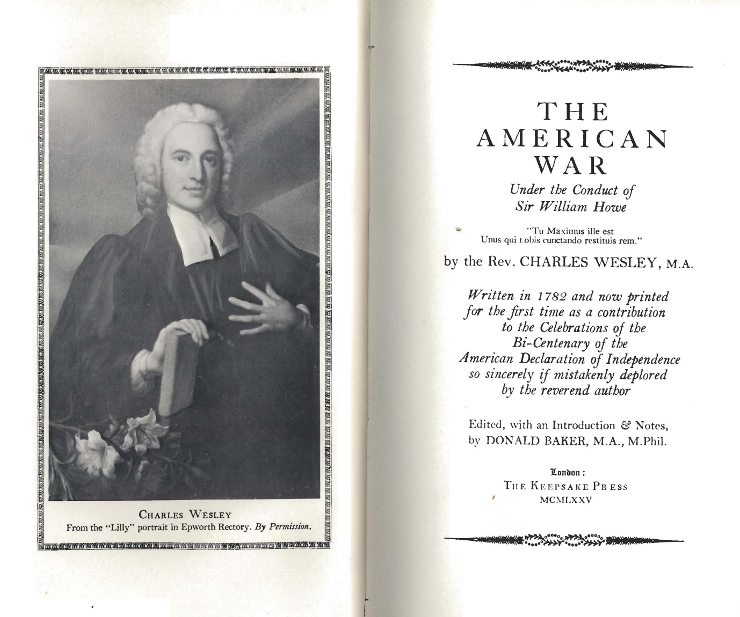 Charles Wesley has finally begun to come out from his brother's shadow. 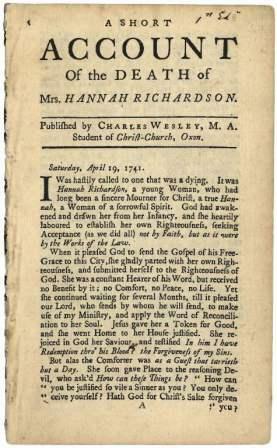 The 250th anniversary of their conversions and the 200th anniversary of Charles' death which coincided in 1988, and now the tercentenary of his birth brought renewed interest in him as a leader of early Methodism. Previously unpublished manuscripts have been examined and published in critical editions within the last twenty years. There is still much more to discover and discuss. 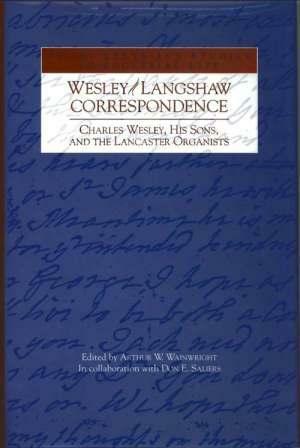 In 1989 Emory University purchased an unpublished collection of thirty-two letters between the Wesleys of London and the Langshaws, organists of Lancaster Parish Church. The correspondence spans close to fifty years and involves two generations of both families. Langshaw's sons who studied in London were frequent guests in the Wesley home during the final years of Charles' life. 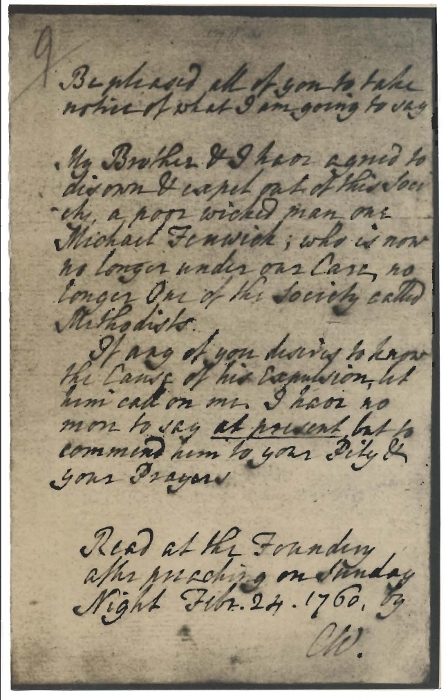 The letters from Charles Wesley to John Langshaw reveal a man of warmth, compassion, and faith; as a Moravian acquaintance once described him, "a man made for friendship." In 1993 Arthur Wainwright and Don Saliers of the Candler faculty published the letters with commentary. 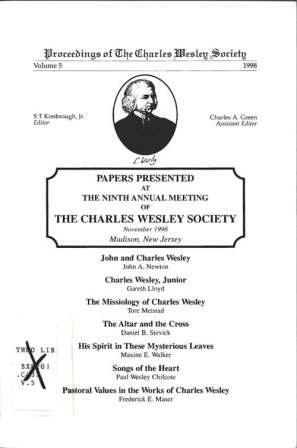 The Charles Wesley Society was founded in 1990 to study the works of the hymnist and minister. 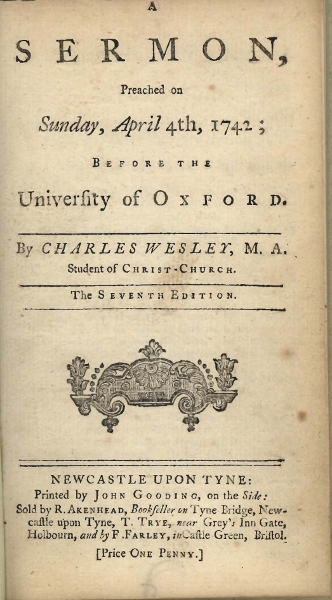 Conference Proceedings each year demonstrate an ongoing scholarly interest in Charles Wesley. 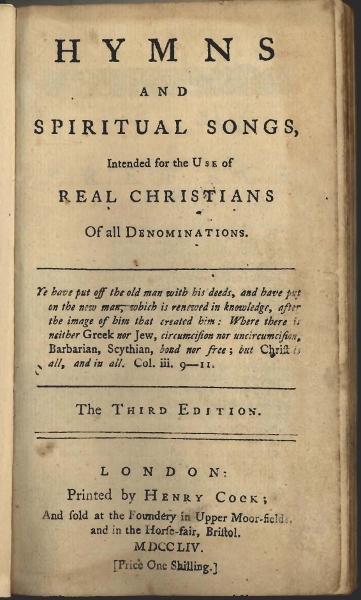 Charles Wesley's hymns are a heritage for Christians of all denominations. His most widely published are "Come, Thou Long Expected Jesus," "Hark the Herald Angels Sing," "Christ the Lord is Risen Today," "O for a Thousand Tongues to Sing," "Rejoice the Lord Is King," and, the most published in American hymnals, "Love Divine, All Loves Excelling." 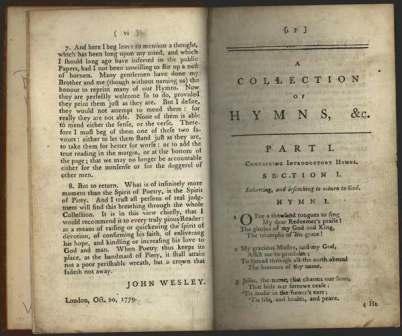 In the Dictionary of North American Hymnody Charles Wesley has a full five percent of hymns indexed before 1978, superseded only by Isaac Watts. 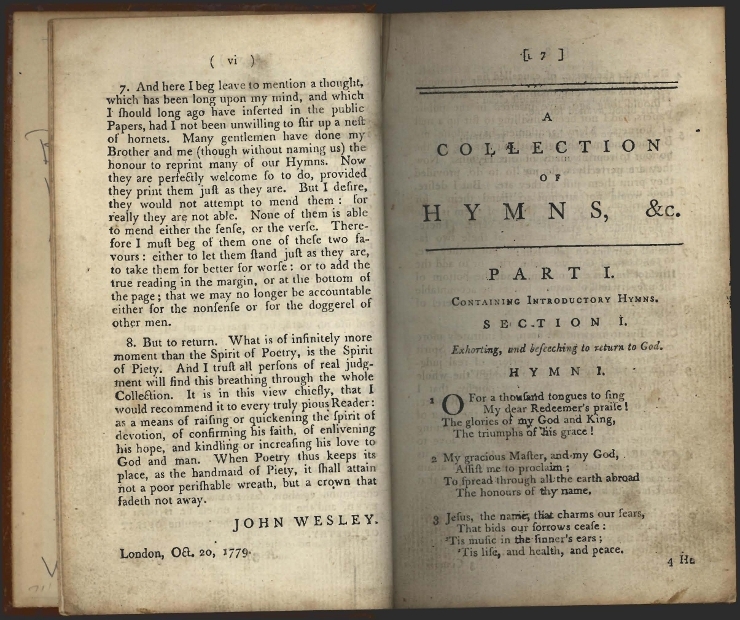 Because of their grounding in sincere religious experience, expression of thoughtful theology, and beautiful use of poetic language, Charles Wesley hymns will have enduring value for as long as Christians sing their faith. 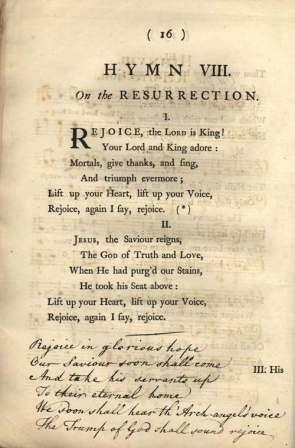 From the early days of his work to today Charles Wesley's hymns have had appeal in many faith traditions. The preface to this edition commends "the unspeakable Advantages that flow from a truly Catholic Spirit, a Spirit of Universal Love."